We've "broken ground" on our Ponderosa improvements! 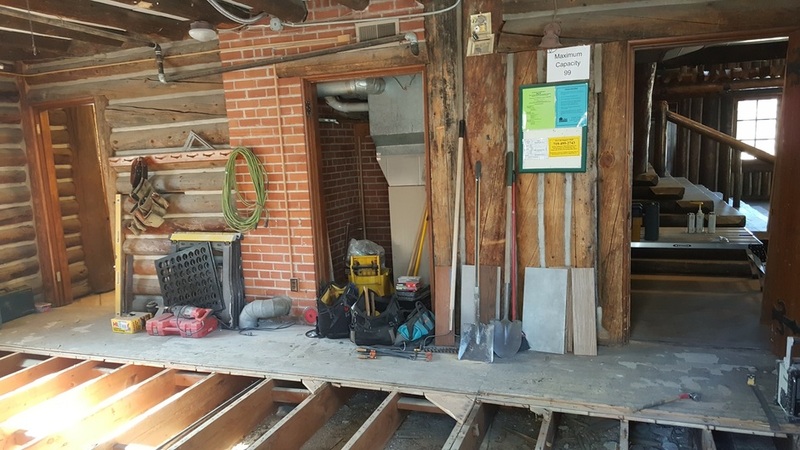 Our current, 'Phase One' of this building rehabilitation is focused on the interior, on the main floor. The process for spending these funds is under a very strict and arduous budget process designed to meet standards for historic reconstruction and preservation. We have historians and contractors double-checking every step of the way. -Floors are open to excavate below the joists for moisture control. New flooring is a resulting beneficial consequence. We are redoing some of the plumbing, too. -The ridges that come up in the summer in the main room floor are getting fixed. In February, 2016 we announced that La Foret's Ponderosa Lodge had been selected to receive a $200,000 grant! These grants are given for requested projects to preserve, rehabilitate, or purchase properties that are of historical significance. To read the full article, announcing the grant in more detail please read it in our March 2016 Newsletter. After these wonderful interior improvements are wrapped up, we will start on the exterior improvements. All these elements have been surveyed and inspected, and we are following specific guidelines according to the grant. With great excitement and eagerness, we are all excited to see the progress these next several weeks will bring! Keep checking back for future improvements and wonderful updates! Thank you from La Foret! La Foret celebrates the long and beneficial relationship with First Congregational. Your confirmation class and summer retreats are on our calendar for 2017, and of course, many of your youth participate in multiple RMC events through the year. We are thrilled that our purpose to provide sanctuary for all to consider the transcendent issues of life remains tangible within your wonderful church. We have good news to share, and you are part of it. 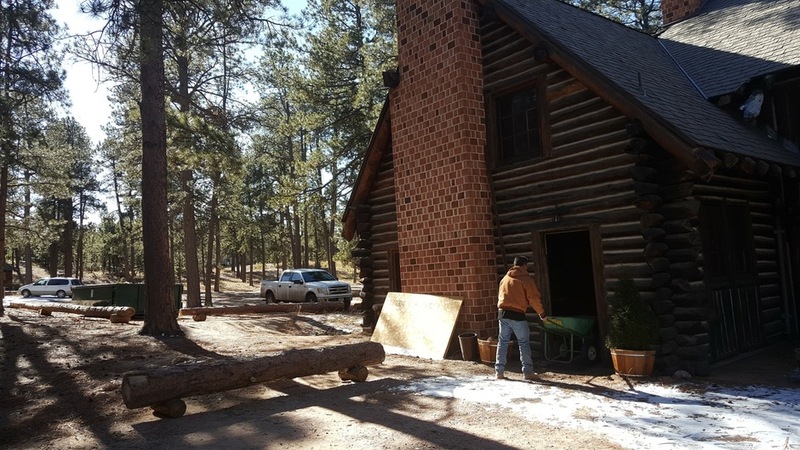 We have received a grant from the State Historical Fund ($200,000) for the exterior restoration of Ponderosa Lodge that requires matching funds from La Foret ($83,000). 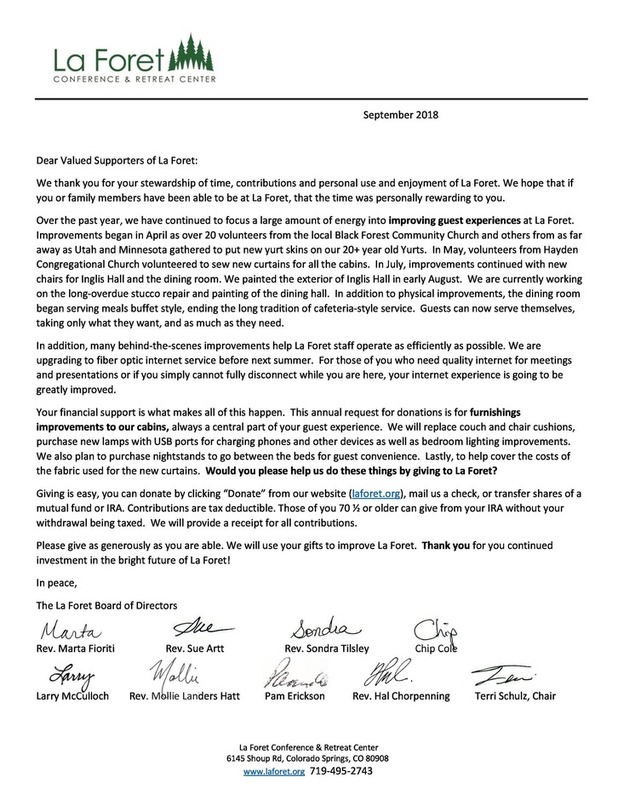 Over ten years ago your congregation gave La Foret $65,000 for the renovation of Ponderosa Lodge as part of a capital campaign. After helping with a new roof 3 years ago, the balance ($44,000) is helping with the required match!!!! THANK YOU. The renovation is mostly external - replacing rotten logs, changing drainage, and fixing cracks in the foundation. The building won’t look very different, but it should last another 90 years with these solutions. We are so thankful. 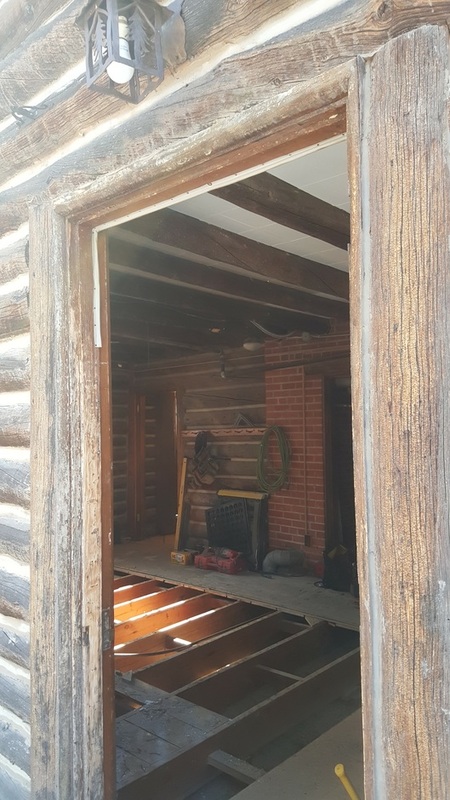 Because of your generosity, we can preserve the essence of the historical character and honor the building and its original owners, while maintaining its National Historic Register status. We could not do it without you. Or, more precisely, we can only do it with you. Thank you and bless you. The idea is to make it last another 90 years.